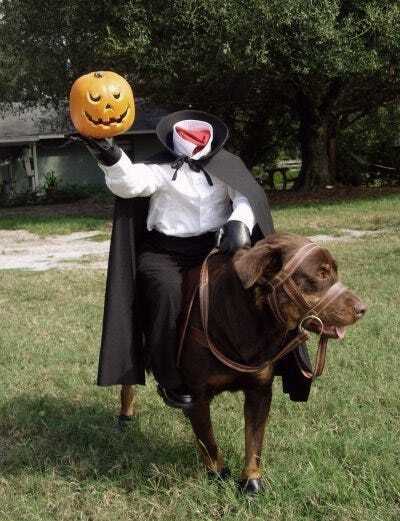 Love them or hate them, pet costumes are already abound on the internet and are sure to make a real life appearance in your neighbourhood soon. 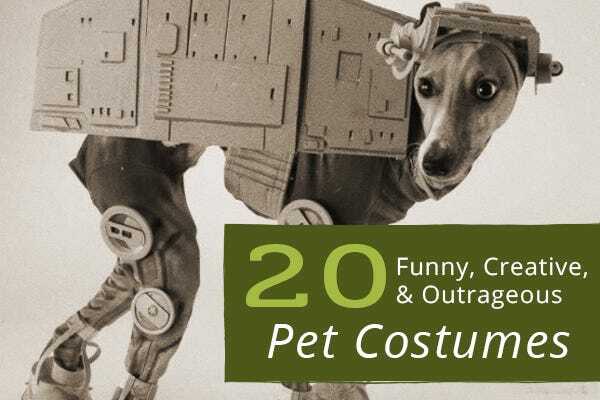 We love cute dog clothes any day of the week, but take a look at our list of the craziest, silliest, and most ingenious dog and cat costume ideas we've seen so far. Wow. 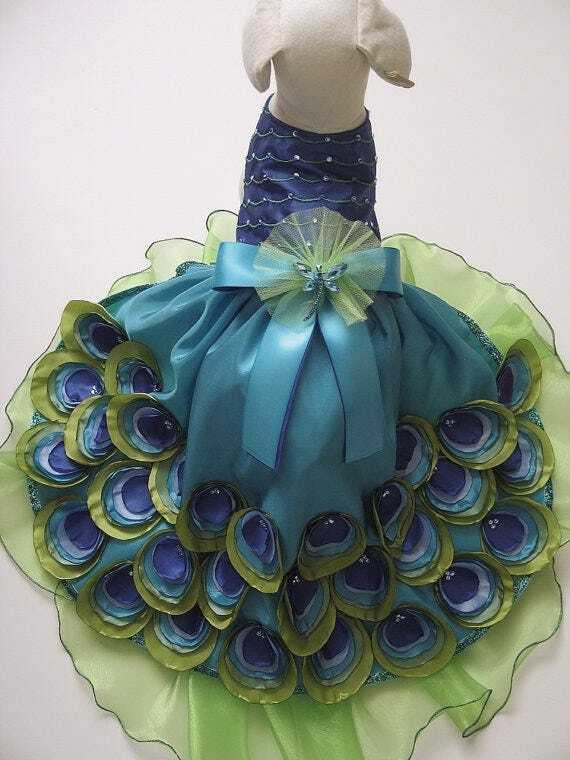 This peacock dog dress (with matching hat!) is exquisite - if a tad ridiculous. And it comes with an equally shocking price tag - $340! See the custom Etsy dress yourself. 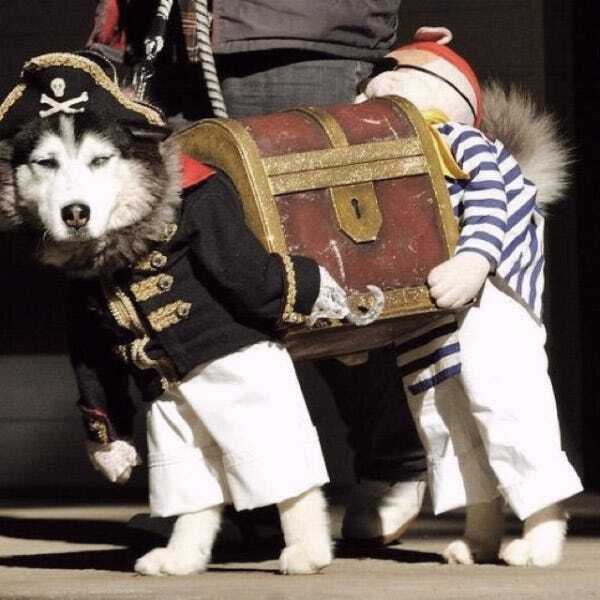 For creative ideas, this pirates and treasure dog costume may just take the gold! A lot of time and effort must have went into this hilarious creation. Arr! One must wonder where the inspiration comes from some of these costumes. Who thinks...I'm going to make my dog be an egg roll! But...successfully pulled off in the end with bonus points for originality. It has to take some kind of fan to create this masterwork. But if any movie following can deliver that sort of fan dedication, Star Wars can. 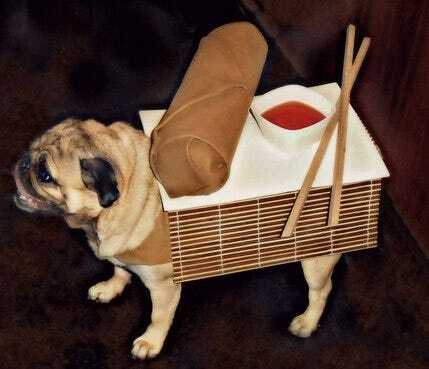 While pretty simple in design, this dog costume is perfectly executed. That face just fits. Cute! 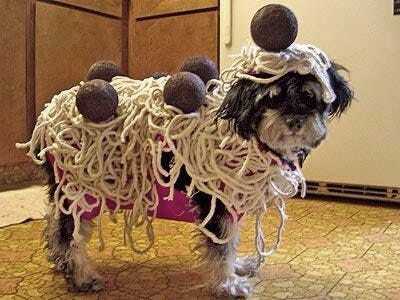 Dressing up your dog or cat like food has to be a category all its own for all its popularity. I think this DIY spaghetti and meatballs takes the cake! This do-it-yourself costume idea is not just creative, it's inexpensive and a great way to use objects on hand. I'll drink to that! 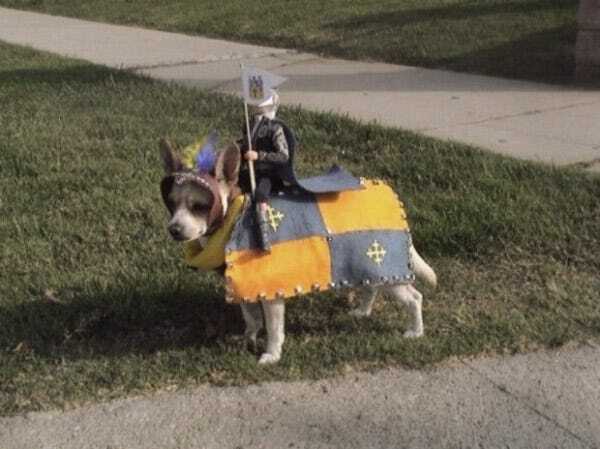 This dog costume is definitely the simplest on our list, but that doesn't make it any less adorable! 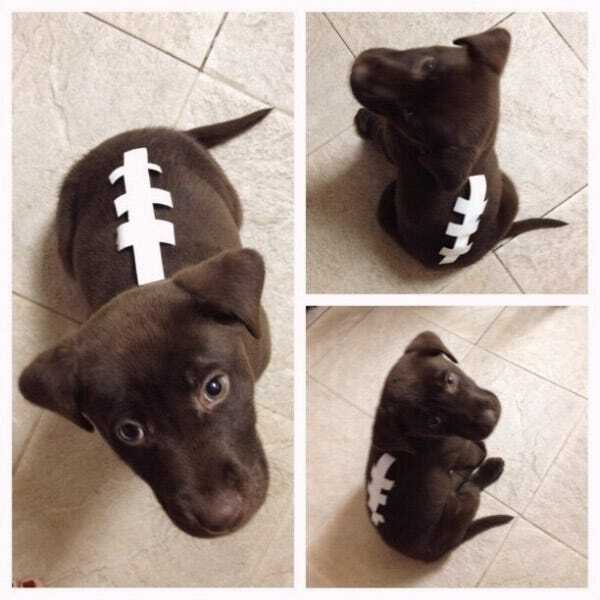 What a sweet costume for a chocolate lab puppy and a family of football fans. Just perfect - right down to the hoof paw covers. 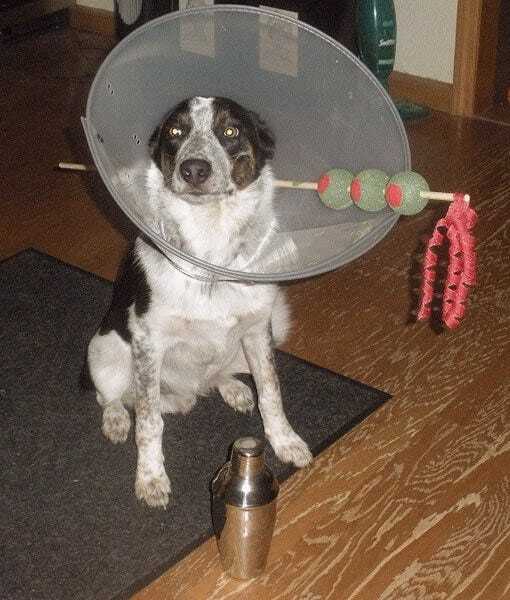 A pet costume true to the spooky holiday it celebrates. 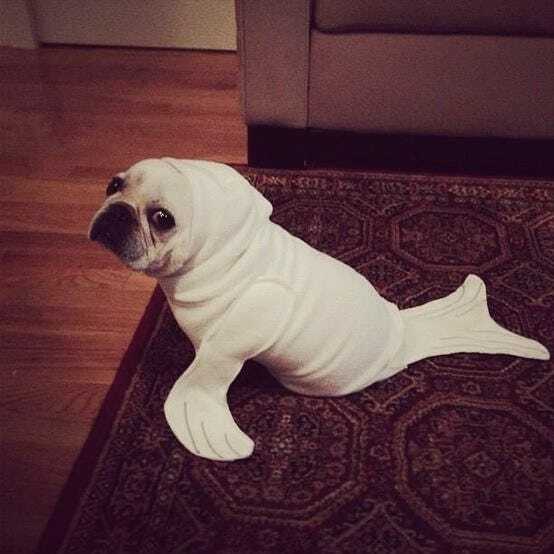 Pugs look funny in just about any costume. 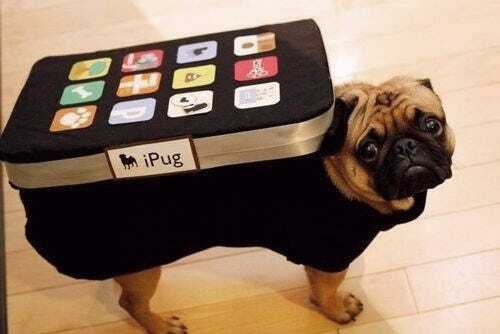 And if you find a way to add pug to the name, you've got a definite win. Corny, but undeniably cute. While not a true costume, per se, this had to make my list for creativity and overall effect. 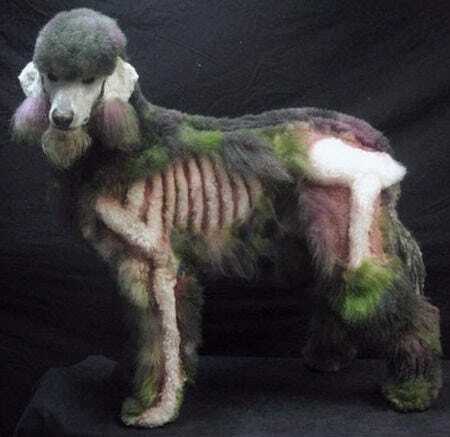 An example of what's called creative grooming, this undead look is created using a dog clipper and pet-safe dye. Oh, and one very talented groomer. 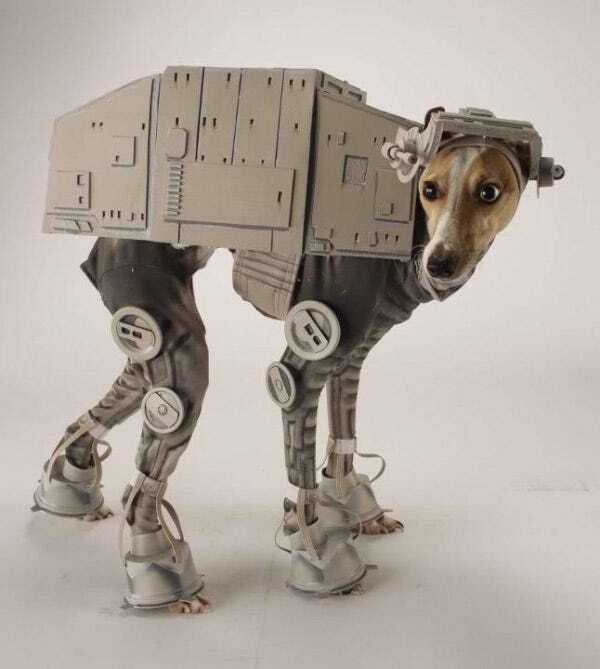 This dog costume doesn't just stand out for its uniqueness - just look at the detail. Huzzah! 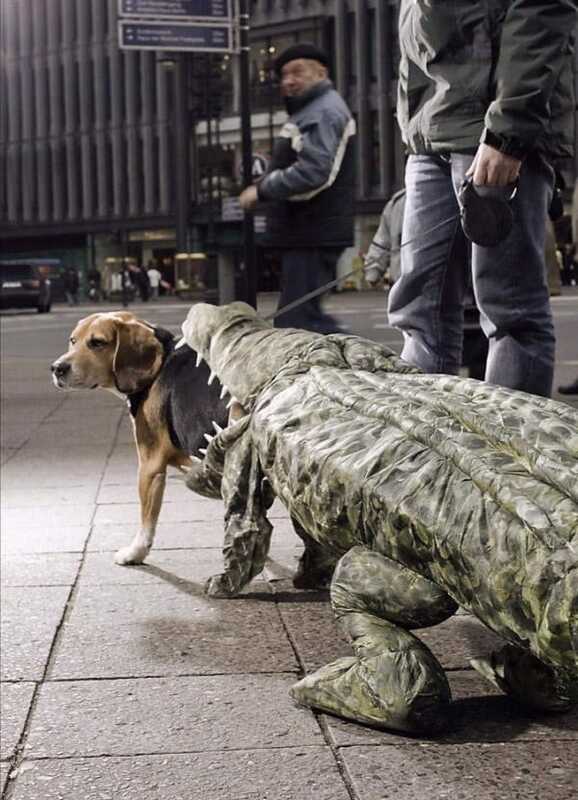 I wouldn't want to be the dog in this costume - I mean, that can't be comfortable! But kudos for the detail in the suit. 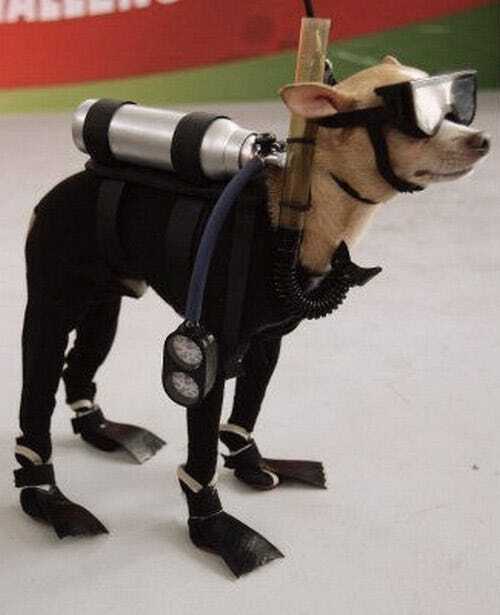 You'd really have to have the right kind of dog to make this work. 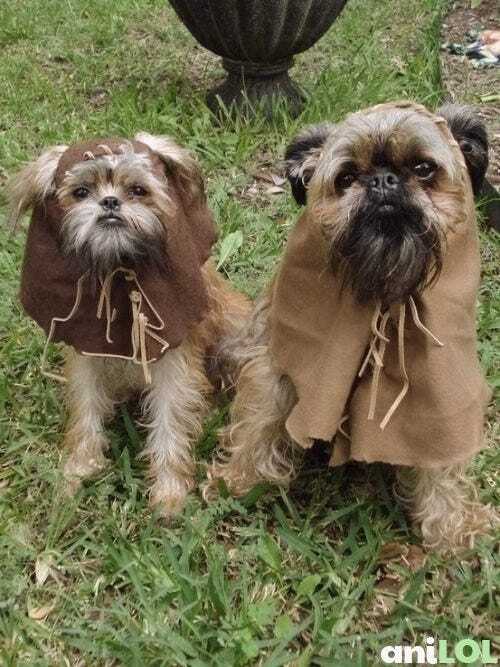 And these dogs are working the Ewok look. Those super simple hoods just add to the effect. 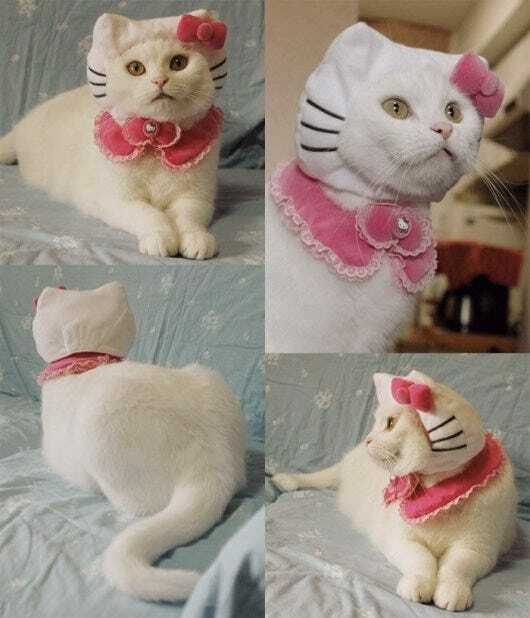 If your cat had to choose a costume, I think this would be it. 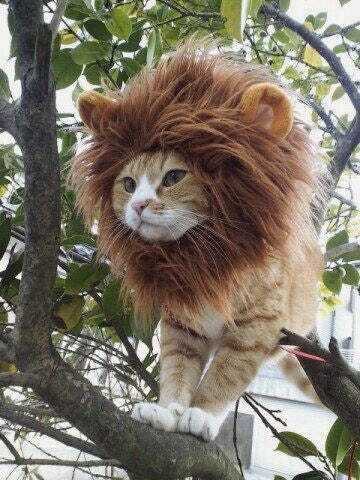 Then again, what cat doesn't already believe he's a lion? 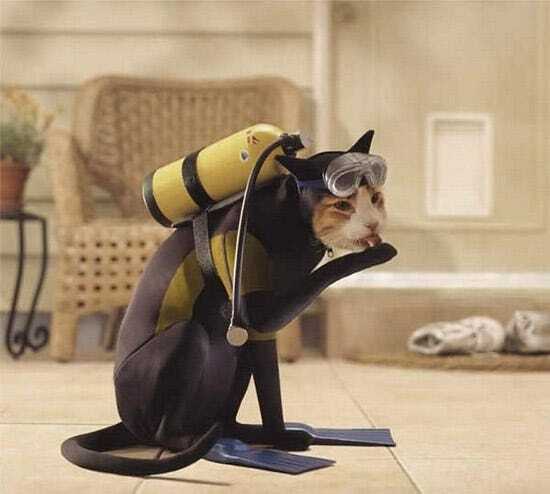 Even more daring and outrageous than Scuba Dog...Scuba Cat! In my opinion, any costume on a cat is a feat. A unitard? Praiseworthy. So sweet! And doesn't the pose just match? 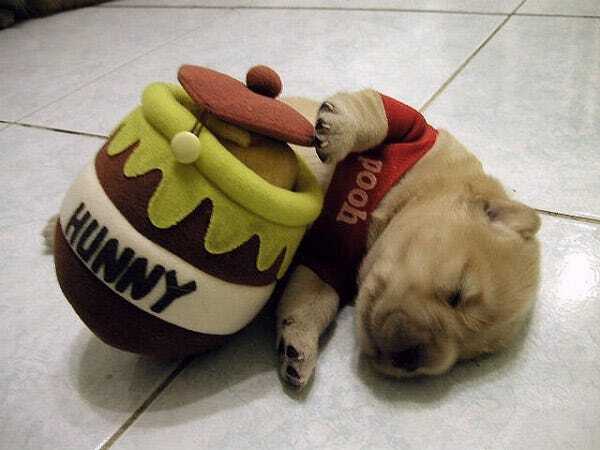 Honey Coma! 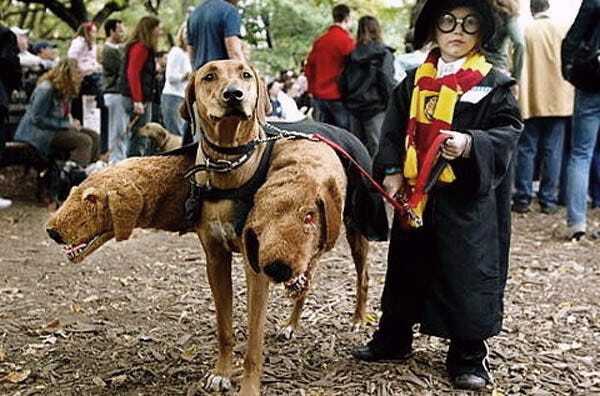 What is the best pet costume you've ever seen?